I planned to blog about our beach trip and Memorial Day weekend tonight but it has been a crazy day and I just do not have the energy. Also, Craft has randomly decided to stop sleeping through the night (more on that later) and it has been a rough few nights of torture with that little stinker so I'm exhausted. In other words, that long-@$$ post will have to wait for another night! 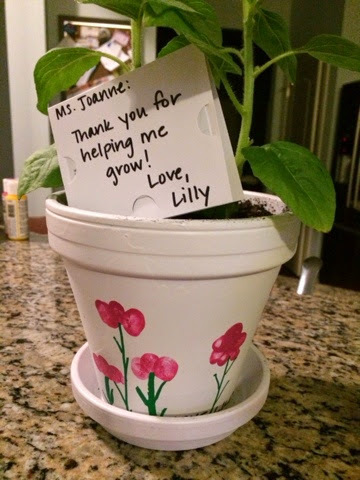 This is Lilly's last week of preschool for the year, and I am so sad about it. We were so fortunate that she has had the best teachers, and she loves them so much (as do we!). I just know I'm going to cry, I wish they could move up with her next year. All of the parents got a note from the program director just prior to teacher appreciation week a few weeks ago which said that the program decided a long time ago that the huge amount of parental support and involvement throughout the year makes them feel more appreciated than any gifts ever could, so please not to send any gifts for teacher appreciation week. 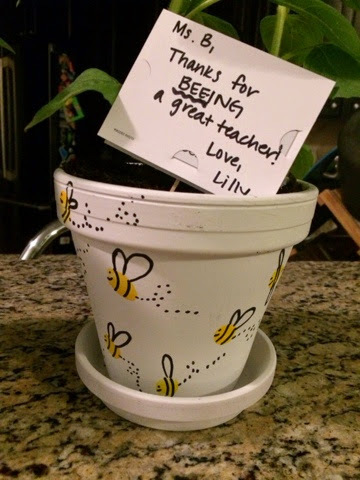 I wanted to send something anyway but honestly could not get it together in time to do anything, so I decided that I'd give Lilly's teachers something at the end of the year instead to let them know how much we love them and how much we appreciate them loving our child. Are those cute, or what?! And they were pretty easy to make. 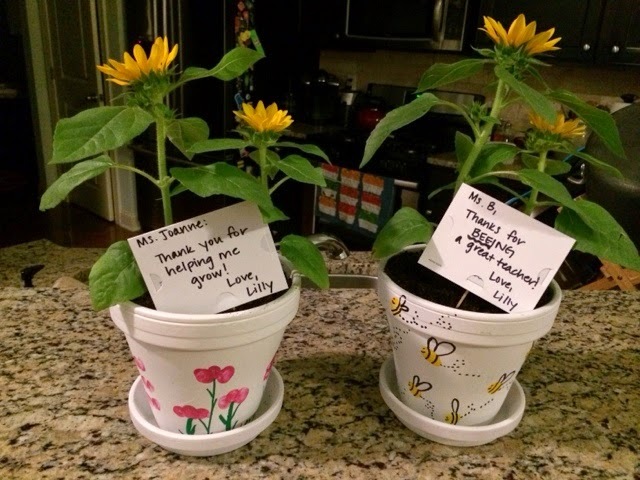 We took a trip to Michaels and Home Depot today to pick up supplies and let Lilly help choose flowers ("she" chose dwarf sunflowers with urging from Carney and myself because they're adorable). Carney put two coats of white spray paint on the planters (I did the first coat but I sprayed too close and was on the verge of ruining them so Carney took over) while Lilly was napping and when she got up we used her thumb and made the pink and yellow thumb prints. The thumb printing was by far the hardest step in the whole process - Lilly didn't understand why she couldn't use her paint brush to paint and had to be bribed with ice cream, oy. After she went to bed I drew the stems and wings with paint markers and then sealed the pots (spray paint sealer which dried in approximately 10 seconds) and planted the flowers. I think they turned out so cute!!! The "garden flags" with the notes contain a small gift certificate (I went with Belk in case you're curious. I know Ms B loves it and so do I, and I figured they were more likely to spend the gift card on themselves at Belk instead of on their kids! ).